One of the most beautiful Ljubljana's architectural and historical gems, offers its setting to meeting planners of imaginative and innovative character. We present Križevniška Church. 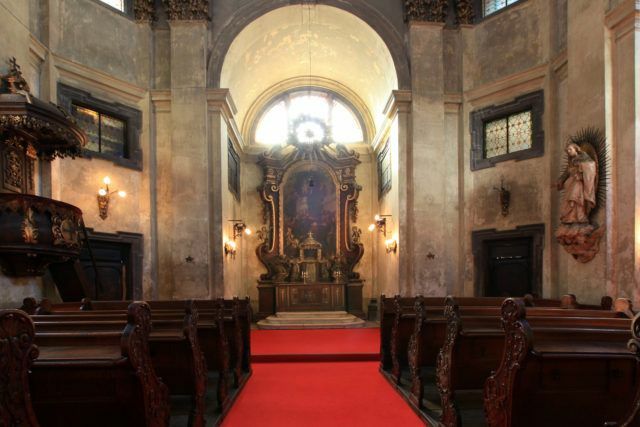 Križevniška Church (also called Križanke Church or Church of Our Lady of Mercy), an astonishing sacral building in the centre of Slovenia’s capital, offers an intimate haven in the very midst of the city’s urban hustle and bustle. The Church is a part of Križanke, the enchanting complex of the former Monastery which was first mentioned in 1268 when the Knights of the Cross (Križ in Slovene language stands for Cross) settled in the complex. The Church, torn down in early 18th century and then rebuilt in Baroque style, bearing a rich front, articulated by pilasters and a cupola, was the first Baroque building in the region. The Church is located in Ljubljana‘s city centre. Its location allows for an easy access to other architectural heritage as well as to the modern spots. In a close proximity of the venue, the National and University Library stands its ground as the exquisite cultural monument designed by the famous Slovenian architect Jože Plečnik. While right from the Church’s doorstep one can step to the beautiful 18th Century square, adjacent to Križanke, surrounded by trees and topped with several monuments dedicated to historical figures spanning from Napoleon to 20th Century writers, academics, composers, etc. Besides, one can easily reach City Museum of Ljubljana with its 2000 years old collections, or take a stroll to the scenic Ljubljanica river decorated with colorful houses and numerous bars and top-notch restaurants, and to the sitting spots on the river’s shore to contemplate the city’s buzz. It is not difficult to agree that the choice of the Križevniška Church for an event is a perfect choice for the venue offers a stunning setting that still breaths rich story of the past while it is, at the same time, blended with the present. The venue allows for smaller performances, concerts, exhibitions, receptions, dinners, fashion shows, business meetings, weddings, and similar. Recently the venue got even more attention for the first Ljubljana’s pop-up dinner named Secret Dinner was organised in this very Church. What a dazzling place for a business or congress dinner! The venue on its 250 square meters with a central area of 11x11m in size, offers 70 seats on benches and 70 additional seats. Standing room capacity allows for 180 people (with benches removed). Experienced team of experts provides comprehensive solutions in the planning, preparation and organisation of the events. In addition, the premise can be fully equipped with audio-visual equipment and facilities, flexible lighting, wireless internet access and, upon request, with a stagem piano, conference tables, various seating/table arrangements or any other equipment meeting planners may require. An enchanting and captivating venue for congress guests that will be blown away with the omni-present monumentality and ever-lasting charm of a magnificent atmosphere. Participants in the events at the Križevniška Church can have a different break and go to Museum of Illusions, located just a short walk from the Church, to test their own limits of perception through illusions and holograms.